In this interactive workshop, participants learn to create a classroom that generates psychological safety and invites emotional and behavioral regulation via the nervous system. Co-presented with a seasoned educator, participants take a deep dive into a regulated learning environment; and they learn by doing. Participants will explore tools for self-regulation in addition to engage in four kinds of classroom practices (connectors, activators, soothers, affirmations) that quiet the primitive brain and open the pathways to connection and learning. 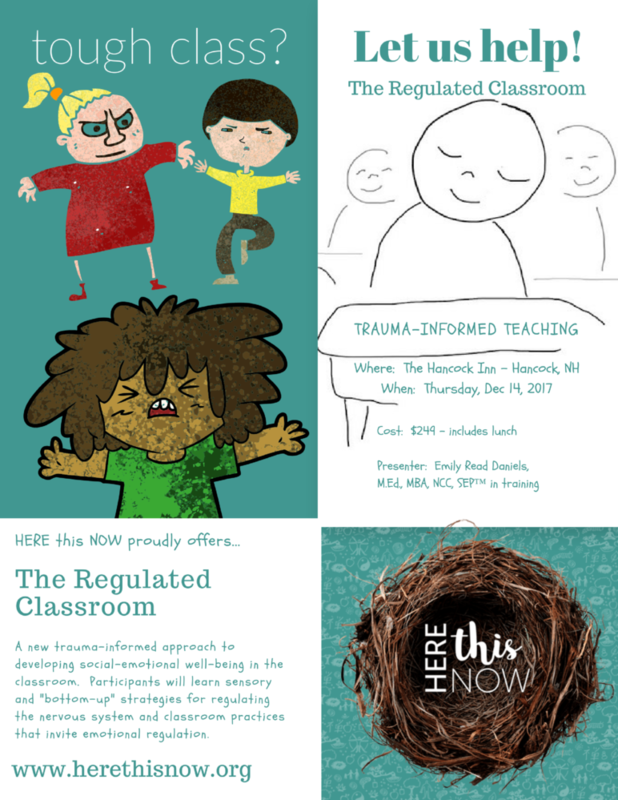 This workshop promises to be fun, engaging, connecting, and inspirational to the educator looking to apply trauma-informed practices in the classroom. Emily, I LOVE what you are offering! Do you only schedule training and workshops in Hancock NH? Would love to see this offered here in Maryland -- we have many public school systems who are working toward trauma-informed schools. Thank you so much for your comment! I travel and offer trainings anywhere in the country. Let's talk more. I can be reached at Emily@herethisnow.org or 603-525-4443. I would absolutely consider offering a training in your neck of the woods if you thought there was sufficient interest.